Get free homeopathy booklet for total and safe cure by Dr.Reckeweg. Dr.Roshanlal Aggarwal and Sons represents Dr.Reckeweg in India, Nepal & Bangladesh. The name Homeopathy comes from the Greek. Word “homios” means “like” and the word “pathos” meaning “suffering”. It simply means treating like with like. 1. Request Free Homeopathy Booklet for Total and Safe Cure by Dr. Reckeweg. 3. Select yes beside “I require free homeopathy booklet – Homoeopathy for Total & Safe Cure”. 4. Soon you will get a response for your query via mail. 5. 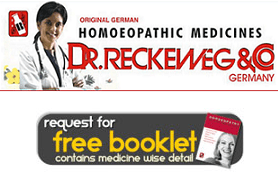 Now wait for your free homeopathy booklet by Dr.Reckeweg. The medical practitioner Heinrich Reckeweg established the Eupha Laboratory. It was done in pursuit of his vision of a natural medicine. His aim was the responsible production of effective, well-tolerated drugs. Today, the pharmaceutical company Dr. Reckeweg & Co. GmbH, Germany, is continuing this tradition of company. Their preparations enjoy success and worldwide appreciation because of their carefully chosen ingredients. Based on their own research, they created a series of often imitated but never equaled, well-tolerated combination drugs. Characterized by their broad therapeutic spectrum, they are highly acclaimed by experts from all over the word. Continuity in the management of the family-owned company. Qualified and motivated employees. Dedication and identification of all colleagues with their products. All of these factors contributed to the worldwide recognition and distribution of Reckeweg preparations. These are today appreciated as reliable and helpful medicine in more than forty countries and in all continents of the world. => Like India Get Free Stuff on Facebook. Subscribe us via mail to get the offers on your mail. I am a sugar patients also.